We present a variant of the CONEstrip algorithm for checking whether the origin lies in a finitely generated convex cone that can be open, closed, or neither. This variant is designed to deal efficiently with problems where the rays defining the cone are specified as linear combinations of propositional sentences. The variant differs from the original algorithm in that we apply row generation techniques. The generator problem is WPMaxSAT, an optimization variant of SAT; both can be solved with specialized solvers or integer linear programming techniques. We additionally show how optimization problems over the cone can be solved by using our propositional CONEstrip algorithm as a preprocessor. 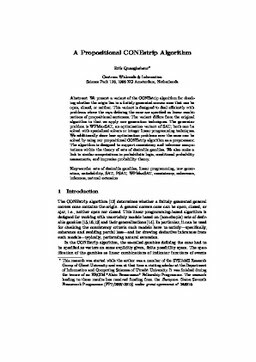 The algorithm is designed to support consistency and inference computations within the theory of sets of desirable gambles. We also make a link to similar computations in probabilistic logic, conditional probability assessments, and imprecise probability theory.